Uber and Taxify (file photo). Oxford University academics, through the Fairwork Foundation, have published the world's first rating system for working conditions in the digital economy. The report was piloted in South Africa and India and sheds light on the working conditions at digital platforms in both countries. 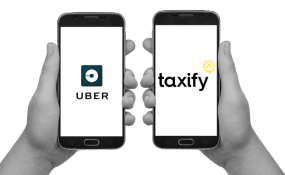 Uber and Taxify in South Africa could do more to improve working conditions for their driver partners, new research shows. The research, conducted in conjunction with the International Institute of Information Technology Bangalore (IIIT-B), the University of Cape Town, the University of Manchester and the University of the Western Cape, is the first of its kind in the world. The results were officially released on 25 March 2019. The Fairwork Foundation's mandate, according to its website, is "highlighting the best and worst practices" in the emerging platform economy. "In a partnership with the International Labour Organisation, we have brought together platforms, workers, trade unions, regulators, and academics to set global principles for fair work in the platform economy." The report looked at conditions on digital working platform such as BOTTLES (alcohol delivery app), SweepSouth (cleaning service app) Uber and Taxify (transportation apps) in South Africa, and Zomato, Flipkart and Rapido in India.